Technology vendors update the Packet Pushers with big announcements and blue sky visions. 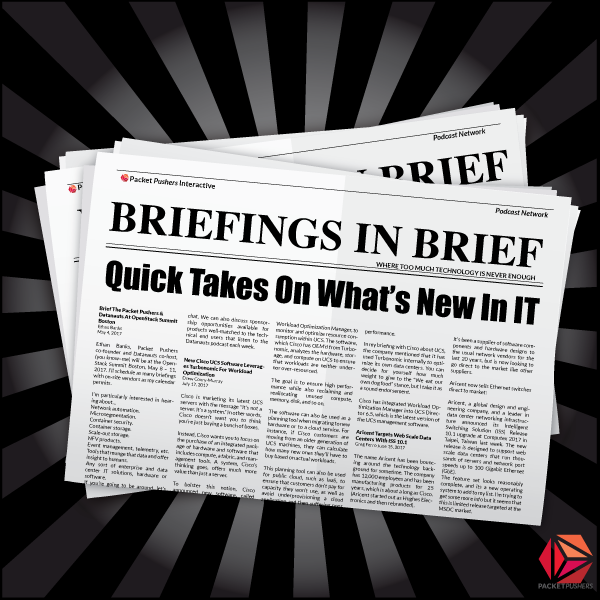 Subscribe to Briefings In Brief for our summaries of the press releases and conversations we find interesting. We filter the bloviation and bombast and give you the best bits. The Briefs will target five minutes and never go longer than ten minutes. That’s the plan. It will be just one person from the team giving you their perspective on the announcement. If the vendor permits, we will add the briefing material to blog post. We will publish the shows when we have something to say. Once we receive a briefing or information then we will get something published, probably about once per day. The Packet Pushers take a lot of briefings from vendors, spending hours each week discussing, learning, and understanding new products and technologies. So many, in fact, that we are unable to write about them in our news channel or our blog channel because writing takes time. A lot of time. This channel is not sponsored but the content will only be about vendors. We will pick which vendors to talk about. We aim to summarize the announcements and make the information relevant to our audience. It won’t be “reading the press release.” There are plenty of other websites for that. Web: http://packetpushers.net/series/briefings-in-brief/ – you listen to podcasts from your web browser for the minimal experience. Tunein: We have now loaded all our channels to Tunein so you can listen to Packet Pushers Podcasts on your Sonos, Alexa, or other fancy wireless speaker system.